Building a cleaner environment — literally. Although bricks may be beautiful, durable, long lasting, and totally trendy at the moment — think upscale urban lofts and startup offices complete with visible ventilation ducts and exposed brick walls — their production takes a significant toll on the environment. Around 8% of all global carbon emissions come from brick manufacturing. For real. Brick-making is a lengthy process, requiring the use of clay kilns set at 2,000ºF for several days. This releases a ton of carbon into the atmosphere. Worldwide, brick-making creates 800 million tons of carbon a year, which seems pretty absurd. For comparison, according to the EPA, the average passenger vehicle emits about 4.7 metric tons of carbon dioxide annually. Now, 4.7 tons of carbon is nothing to sneeze at, but that means the brick manufacturing industry creates as much carbon as 170,212,765 cars. Fortunately, one company has found a way to create bricks using a process that’s actually millions of years old. Founded by Ginger Krieg Dosier and her husband Michael, BioMason grows bricks by injecting sand with microorganisms. It’s actually a technique that mimics how coral is produced in nature. “We grow bricks by compressing what happens in nature over thousands of years into a few days,” says Leif Forer, BioMason’s COO. 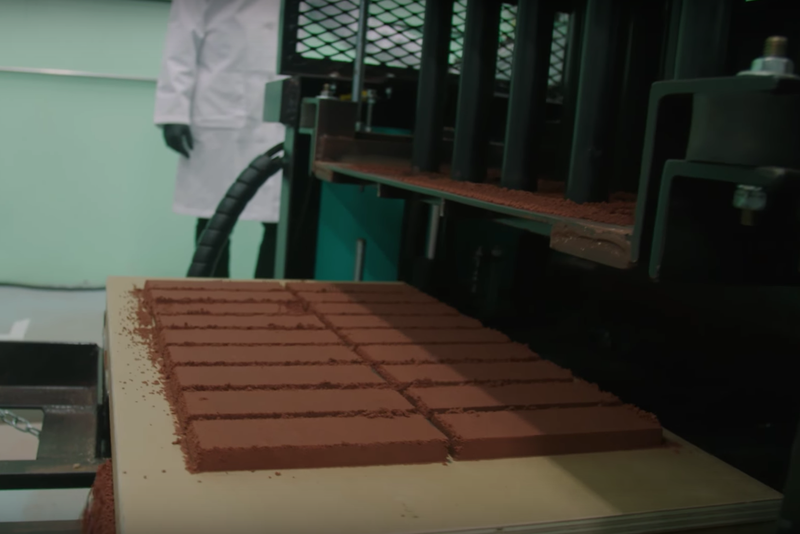 The process takes about four days, and the result is bricks that BioMason says are strong enough to be used in construction, just like their pollution-heavy counterparts. Their innovative brick-making approach relies on a rod-shaped bacteria known as Bacillus. As Dosier explains, the organism creates a microenvironment which allows for the formation of calcium carbonate crystals. Although the natural process of forming coral takes years, the engineers at BioMason have found a way to create their bricks in just a few days. The entire bio brick-making process happens at room temperature, so there’s no need to burn fossil fuels. Not only does BioMason’s brick require no energy-wasting heat, the creation of the bricks actually absorbs carbon from the air. These carbon-reducing bricks are naturally off-white but easily absorb colors and can be formed into different textures. BioMason’s engineers can easily add color to make their bricks appear old and burnt without needing fire. According to Inc., the bio bricks are expected to be cost-competitive with standard bricks. The sustainable building materials market is currently a $36.1 billion dollar industry, and it’s expected to grow 10% (or more) annually for the next few years. BioMason currently has agreements with two US-based manufacturing companies, and their bricks are expected to hit the market sometime this year.